MONTREAL, Sept. 17, 2018 /CNW Telbec/ – Innovation knows no bounds. Today, Holt Fintech Accelerator is proud to welcome the 13 teams that will participate in their 12-week program. Announced earlier this year in Montreal, the project serves to continue Sir Herbert Holt’s entrepreneurship legacy. Holt was Canada’s technology pioneer, in the transportation, energy and banking sectors, even creating one of the largest privately-owned utilities in the world. 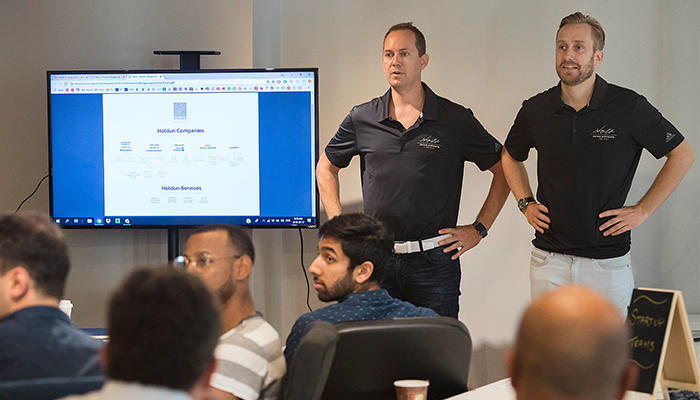 The Holt Accelerator offers participants the unique opportunity of benefiting from hands-on help through committed financial institutions, venture capital firms, partners, training sessions, world-class mentors, immersion in the fintech environment, financial investments and more. Coming from vastly different backgrounds in terms of geography, industry and technology, the chosen startups will have to push the envelope of what has already been achieved in the field of disruptive technologies, especially AI. Consilium Crypto provides funds, family offices and exchanges with Actionable Insights for cryptoasset markets using custom indices, market data, news and alternative data. Headquartered in Toronto, ON, with an office in Montreal, QC, Canada, Consilium Crypto provides companies with a data-driven edge from billions of data points, covering over 90% of global trade volume in cryptoassets. Holt Accelerator offers participants the unique opportunity of benefiting from hands-on help through committed partners, training sessions, world-class mentors, immersion in the fintech environment, board meetings, financial investments and more. In addition, the Holt Accelerator program is the only accelerator offering one of Canada’s largest applied AI solution providers, Stradigi AI, a proven resource for all fintechs that want to get ahead. Everything is thought out to get the best out of the program and unleash the selected startups’ full potential. The Holt-Dunn family is the direct legacy of Sir Herbert Holt and one of Montreal’s finest. Their ancestor immigrated to Canada in 1873 and built the Montreal Light, Heat & Power Company, which would later be nationalized into Hydro-Québec. Business people at heart, members of the family have founded or owned over 300 companies locally and internationally. At one time, the family held assets of about $3 billion (equivalent to $40 billion in today’s currency). That amount was 10 times larger than the Canadian government’s circulating currency. Sir Herbert Holt was inducted into the Canadian Business Hall of Fame in 1979 and holds the record as the longest-serving chairman and president of RBC (from 1908 to 1934). His participation was crucial in turning RBC into the country’s largest bank and the third largest in North America.